the encryption software. A number of industry verticals such as healthcare and BFSI have to meet the terms of stringent regulations such as HIPPA and PCI DSS, which needs an execution of data security solution. This is boosting the overall demand for encryption software across the world. In addition, growing internet usage and rapid digitization are some of the major factors that positively affecting the growth of the overall market. Companies are required to execute encryption software solutions in order to safeguard the data owing to various security risks. Moreover, increasing reliance on online transactions is also boosting the growth of the global encryption software market and expected to create huge opportunities in near future. 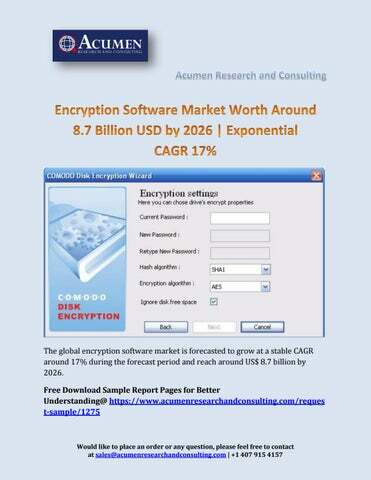 Browse All official Market Research Reports Press Releases@ https://www.acumenresearchandconsulting.com/pressreleases Asia Pacific to Grow at Highest Rate in Encryption Software Market Geographically, the global encryption software market has been divided into North America, Europe, Asia Pacific, Latin America and Middle East and Africa. Asia Pacific is expected to hold the significant market share and grow at highest growth rate during the forecast period owing to the lack of storage infrastructure which has forced enterprises to store data on cloud. 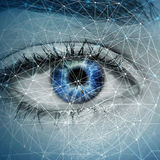 Furthermore, growing penetration of IoT, BYOD and cloud services are boosting the growth of the regional encryption software market. Rapid technological advancements in the manufacturing industry in nations such as India and China and blooming retail and IT & telecom sector are supplementing the growth of the regional market. North America is also expected to witness significant growth during the forecast time frame due to the growing technological advancements and early adoption of BYOD services. The U.S. is projected to show highest growth throughout the forecast period owing to the presence of large number of IT and telecom companies in the country.